It is officially racing season at the Dacotah Speedway. The green flag waved for the first time on Friday, May 6th. Race fans packed the stands to see 117 drivers from all over North Dakota, Montana and even Wyoming battle for that elusive feature win. Fans also gave from the heart when they raised over $1,400 dollars for Levi Gartner, the son of INEX Legend driver Joe Gartner, who is currently battling stage 4, Neuroblastoma. Picking up where he left off last season, Jason Berg started on the pole for the IMCA Sport Compact feature. Berg, who won the last three IMCA Sport Compact features last season, pulled away quickly as Dylan Sandberg and Josh Houn battled for second. 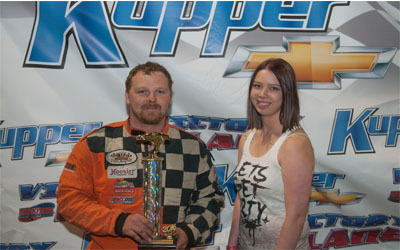 Sandberg cleared Houn for the position, bringing last year's IMCA Sport Compact champion, Josh Roehrich, with him. As Berg's lead continued to grow, Sandberg had his hands full with Roehrich. They raced side by side until Roehrich took second with four laps to go. Berg quickly maneuvered around lapped traffic before taking the checkered flag. Berg led all 10 laps and dedicated his feature victory to his friend who passed away earlier this year. Josh Roehrich finished second ahead of Dylan Sandberg, Chance Seelye and Alex Thompson. Wishek, North Dakota's Brent Vetter started on the pole for the Hobby Stock feature. Vetter led the first lap as it was a four car battle for second between Jeremy Engelhardt, John Gartner Jr, Josh Roehrich and Wyatt Rath-Wald. 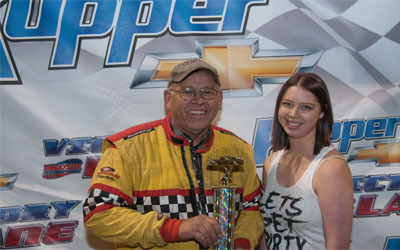 Last year's Hobby Stock champion, Rath-Wald, shuffled into the second position but Gartner Jr was all over his rear bumper. A lap seven caution reset the field and on the restart, Rath-Wald dove low under Vetter to battle for the lead. They raced door to door for several laps before Rath-Wald took the lead with seven laps to go. A caution with three laps to go put Vetter and Gartner Jr on Rath-Wald's rear bumper. On the restart, Vetter went low as Gartner Jr went high but Rath-Wald had better drive off in the corners. 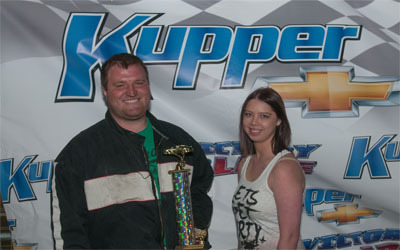 Rath-Wald held on to win the first feature victory of the season. 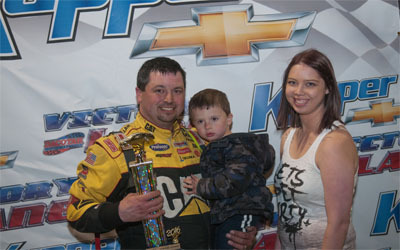 John Gartner Jr finished second while Brent Vetter finished third. Last lap contact between Aaron Aaseth and Josh Roehrich allowed Kamern Glatt and Curt Michaelsohn to slip by and finish fourth and fifth respectively. Shane Williams and Tom Wagner started on the front row for the INEX Legends feature. Williams car was strong early as he quickly pulled away, leaving Wagner to battle for second with Nate Keena. As they raced hard for second, it allowed last year's INEX Legends champion, Donavin Wiest, and Steven Kuntz to close in. However, William's car began to fade and despite racing hard for second, Keena, Wagner and Wiest slowly started to reel in the leader. A series of back to back cautions were the last thing William's wanted to see. On the final restart with five laps to go, Wiest dove his car low underneath Williams and cleared Williams coming out of turn two. Wiest led the final four laps to win the feature over Shane Willams. Steven Kuntz finished third ahead of Drew Papke as Tom Wagner made a last lap pass on Nate Keena to finish fifth. Last year's WISSOTA Street Stock champion, Chris Michaelsohn, started on the pole along side Jeremy Engelhardt for the WISSOTA Street Stock feature. Michaelsohn cleared Engelhardt on the start as Engelhardt raced side by side with Deryk Voller for second. Voller slipped by Engelhardt and quickly reeled in the leader, Michaelsohn. They briefly battled for the lead but Voller's low line around the track prevailed and he pulled away. It was a four car breakaway between Voller, Michaelsohn, Engelhardt and Eric Harpole but a caution with eight laps to go regrouped the field. On the restart, Voller and Michaelsohn raced side by side for the lead. Michaelsohn retook the lead with seven laps to go as Voller quickly slipped into the clutches of Engelhardt and Harpole. Engelhardt quickly passed Voller for second and challenged Michaelsohn for the lead before a caution set up a green-white-checkered finish. Engelhardt and Voller briefly raced side by side for second before Voller retook the position and threw his car low underneath Michaelsohn. However, Michaelsohn pulled ahead of Voller out of turn four and held off Voller for the feature win. Jeremy Engelhardt, in his first full-time season racing WISSOTA Street Stocks, finished third as Eric Harpole and Hunter Domagala rounded out the top five. In the final feature of the night, Marlyn Seidler and Drew Christianson started on the front row of the IMCA Modified feature. Seidler quickly pulled away as Christianson and Shawn Strand battled hard for second. As they continued to race for second, Spencer Wilson quietly lurked in fourth. Christianson cleared Strand for second but Strand now had his hands full with Wilson. With 10 laps to go, Wilson slipped by Strand before a caution regrouped the field. On the restart, Seidler pulled away from the field again while Wilson passed Christianson for second. A caution with eight to go reset the field once more, but once again, Seilder pulled away. Christianson challenged Wilson for second and they raced side by side with six laps to go. Wilson held off Christianson as Domagala raced door to door with Strand. Strand's car started to fade in the closing laps, as he lost fifth place to Hank Berry with three laps to go. Domagala's strong charge to the front came up short behind Drew Christianson and Spencer Wilson as Marlyn Seidler led all 25 laps to win his first feature victory at the Dacotah Speedway since 2013. Up next on the high banks of Dacotah Speedway is The Trailer Store and Little Caesars Pizza night on Friday, May 13th. Front gate opens at 6pm and green flag flies at 7pm. Admission for 13 and older is $12. 12 and under are free. Advance, discount tickets are available at select Cenex locations in Mandan, Bismarck and Lincoln. 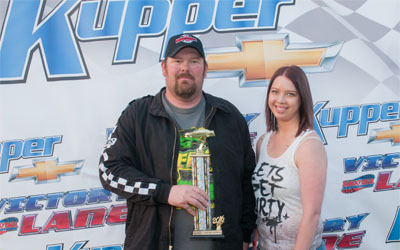 For more information visit us online at http://www.dacotahspeedway.net/ or visit our YouTube channel. Fans can also follow us on the following social media sites: Facebook, Instragram and Twitter. And for instant updates text the word “speedway” to 20691. Dacotah Speedway is a high-banked, three-eighths-mile clay oval located at 2500 Longspur Trail, just to the south of Memorial Highway, Mandan, ND.